Subaru BRZ revealed | What Car? Here's the first image of Subaru's BRZ rear-wheel-drive coupe concept car. The BRZ Concept-STI will make its debut at the Los Angeles motor show later this month, while a production version which is expected to remain pretty true to the concept car goes on sale in mid-2012. 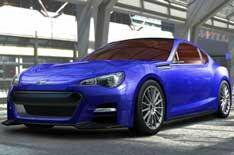 Subaru has co-developed the BRZ with Toyota: whose own concept car is called the FT-86. External styling differences between the brands' cars are likely to be limited to bumper, grille and light designs. The two cars share most parts under the skin, including the rear-wheel-drive chassis and Subaru-developed 2.0-litre four-cylinder 'boxer' engine. In this the pistons lie flat in two opposing pairs, punching out like boxers. Subaru says that the BRZs engine layout and low placement within the car will help to give it a particularly low centre of gravity. Subaru hasnt released any technical details, but the Toyota FT-86 is rumoured to have an output of around 200bhp. The BRZ is likely to have similar figures, but the STI-Concept suggests a higher-performance version could also be on the cards. Theres no word on prices, but wed expect the entry-level BRZ to be on a par with rivals such as the Audi TT and VW Scirocco, so a starting point of around 25,000 is likely. Various versions of the Toyota FT-86 have been seen at recent motor shows, but the production car will make its debut at the Tokyo motor show on November 30.